Olivia Cleans Green: I am WOWed by The Seasonal Diet! 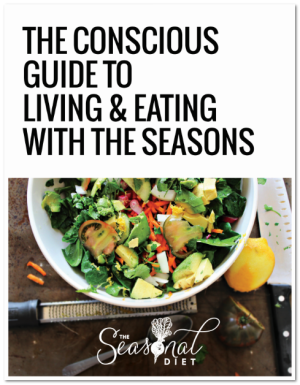 My friends Sarah and Peter at Cooking with CSA have created The Seasonal Diet, an awesome new membership product to inspire and guide folks through seasonal plant-based, gluten-free eating. I just downloaded The Seasonal Diet book onto my iPad on Friday and it is fandiggitytastic! Check out the Seasonal Diet here. Because of my training at Institute for Integrative Nutrition, I already ate pretty healthily before joining Cooking with CSA. I'm also not a recipe person. I tend to joyfully be a creature of habit. Honestly, I just joined their recipe subscription service because I like Sarah & Peter, I share their passion for community and food, and I believe in what they are creating (which is why I became an affiliate for them). However, my membership with Cooking with CSA has supported and encouraged me try recipes that allow me to get a wider assortment of veggies and nuts in my diet and it feels good! I love Sarah's creative recipes! My favorite Cooking with CSA recipe is Costa Rica Crunchers. Watch the recipe demo on YouTube. The Seasonal Diet is part cookbook, part PSA for good clean food from small farms, part invitation to the wonderful world of your kitchen, part meal plan, part community, and 100% encouraging! Check it out at TheSeasonalDiet.com. Thanks for the support My friend:) We are grateful for you!!! Happy Monday!